This article will discuss different shelter options for backpacking, and may introduce you to some “non-traditional” shelters for lightweight backpackers. Most shelters for backpacking fall into one of four categories: Double-walled tents, single-walled tents, tarps, and hammocks (typically combined with a tarp). We will cover each of these categories and hopefully enable you to make a better decision on what kind of shelter is best for you. In the end, though, there are benefits to owning several different types of shelters (especially when you can store it at someone else’s place with self storage startups like Neighbor). When most people think of a tent, this is most likely what they imagine. A double-walled tent is just that – a tent that has two walls. Typically this consists of an outer wall that acts as a rainfly (which may cover the entire tent or only the upper half), and an inner wall that comes into contact with you and your gear while you are inside the tent. There is a reason why most companies primarily make double-walled tents: functionally, they work extremely well. The purpose of the outer wall is two-fold – to keep water from the outside environment, and the inside environment, off of you and your gear. The outside environment is obvious – rain falls on the outer wall, and if your rain fly extends all the way to the ground, there is no chance of it getting inside the tent. If your rain fly only covers the top portion of your tent, hopefully the rain just continues rolling off of the fly and doesn’t have a chance to settle on your side walls. When backpacking, we also need to worry about moisture from inside the tent. Humans put off a lot of water each day through breathing and perspiration. (Perspiration is always occurring, even when you aren’t actively sweating.) When you lay in your tent all night, there is a fair amount of moisture being released from your body that has to go somewhere. A well-designed tent will have some sort of mesh fabric toward the top of the tent that will allow the warm water vapor released from your body to pass through that inner wall. When the water vapor hits the rain fly, it may (depending on the weather that night) condense on the inside of the rain fly and trickle down, keeping you and the contents of your tent dry. 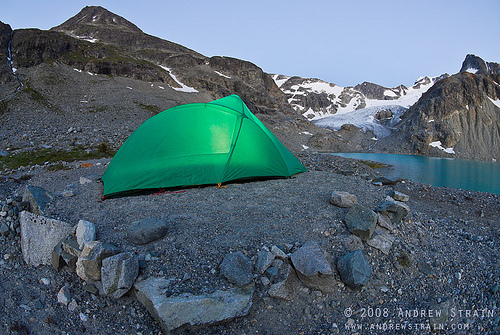 Tents whose outer walls extend all the way to the ground (instead of just covering the top) are common among high-end backpacking tents. Typically the tents whose rain fly only covers the top portion are the kind of tents you will find at Walmart, Costco, sporting good stores, and other “big-box” stores that sell to the “masses.” That’s not to say if you have one of these tents you can’t be a backpacker – I backpacked with lower-priced gear for many years and did great. But a tent that isn’t completely covered by an outer wall can still get you wet – if you or your gear rubs against that lower inner wall (which is now the only wall between you and the outside), moisture can be “wicked” through the fabric. If double-walled tents are so great, why the rest of the article? Couldn’t we just stop here? We could, and many do. The only real disadvantage to a double-walled tent is that it requires extra fabric for that extra wall, and extra fabric means extra weight. However, I bring a double-walled tent on most of my backpacking trips, and I am still able to achieve a base weight of around 10 pounds (to find out more about “base weight”, read our How to “Go Light” article). However, by bringing a heavier shelter, I have to pare down the other aspects of my setup even more if I want to reach 10 pounds. Note: With both double-wall and single wall tents, you may hear the term “free-standing” or “non free-standing.” A “free-standing” tent means that it doesn’t require stakes; it stands on its own. If you can pick up your tent (empty of course) and move it five feet to the left, it is free-standing. A “non free-standing” tent requires one or more guy lines and stakes for it to stand up and hold its form or shape. These tents cannot simply be picked up and moved; they must be un-staked and then re-staked. 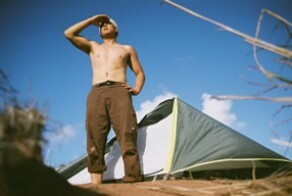 Certain types of terrain may be unsuitable for non free-standing tents, for example, extremely sandy desert terrain or slick-rock desert terrain (both situations where stakes don’t or won’t hold). Some non free-standing shelters will be lighter than their free-standing counterparts because less poles may be required. Single-walled tents do away with the outer rain fly and just have one piece of fabric between you and the outside world. Because there is no rain fly, these tents can’t have an open mesh top, and must rely on strategically placed vents to prevent the humid air you are producing from condensing on the inside of the tent. If you happen to have a single-walled tent that doesn’t have proper vents, keeping the door partially unzipped is a good way to help keep things dry. Single-walled tents take a little more skill to use properly. More care must be taken when choosing a camp spot. Areas to avoid would be low-lying marshy areas or areas right next to a river. If you tend to backpack in very humid environments, realize that a single-walled tent may be more of a challenge than for the desert hiker. Because of this, single-walled tents are typically not the mainstay of large companies like The North Face, Mountain Hardwear, Big Agnes, etc. (see the article on “The Cottage Industry” for more information). Many single-walled tents utilize the hiker’s trekking poles, thus eliminating the need for poles (and extra weight!). Check out the designs from Six Moons Designs or Tarptent to see some examples. A “bivy” is a shelter that could be placed in the “single-wall” category. A bivy can most certainly be used as a stand along shelter. However, with lightweight backpacking, bivies are often used in conjunction with a tarp, so I’ve put the bivy information under the tarp category. Note: Companies like Black Diamond make very popular (and expensive) single-walled tents. However, these tents are built tough for 4-season use, and for the purposes of this article (covering 3-season shelters) are probably not what you want to purchase. Many double-walled tents can be purchased that are lighter than these 4-season single-walls. See below for specific companies that make single-walled tents. Tarps are just that – a tarp! There is no floor to these shelters; you just set up the tarp to cover you and your gear. 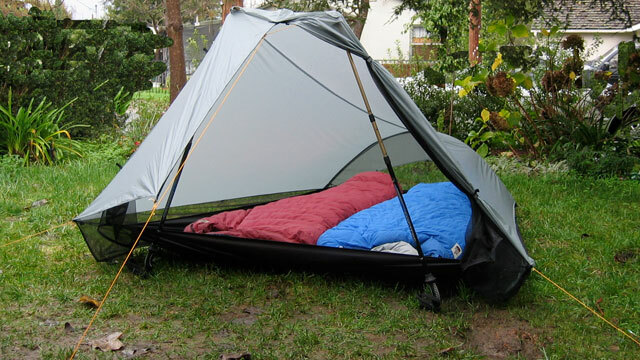 Typically the tarp has no poles – the hiker’s trekking poles are used instead, thus saving even more on weight. (For those who don’t use trekking poles, lightweight single poles can be purchased). These tarps are not your average tarp, however. These tarps are made of very light material, ranging from the silnylon used in many high-end double-walled tents, to cuben fiber – one of the lightest and strongest materials used in the outdoor industry today. In addition to specialized fabrics, these tarps usually utilize something called a “catenary cut ridgeline.” Without getting into the complicated math (we’re here to have fun, right? ), this “catenary cut” increases the strength of the tarp, helps shed wind, and helps reduce sagging of the tarp. These are desirable qualities in any shelter, but are particularly important with tarps. Sleeping underneath a tarp that is sagging or has gone slack in certain areas can be miserable, as even a slight breeze will cause the tarp to flap, sometimes very noisily. Improper pitching of your tarp will cause sagging, but rain can also cause sagging depending on the type of fabric the tarp is made of. If you choose a tarp for your shelter, that doesn’t mean you have to sleep directly on the ground. Most people who go this route bring a ground cloth that goes under their sleeping pad. This ground cloth can be made of polycro (great ones can be found at Gossamer Gear), Tyvek, or other materials. In addition to the ground cloth, a bivy is often used. A bivy is like a little “cocoon” that you slip your sleeping bag into. Your sleeping pad can either go inside the bivy sack with you and the sleeping bag, or it can go underneath the bivy. They are typically made out of a waterproof/breathable fabric that allows your body moisture to pass through, while keeping any rain out. (Don’t buy a bivy that isn’t breathable! You will be soaking wet from your own perspiration in the morning!) The reason for the bivy is that while a tarp will cover you from most rain, if the wind is blowing and the rain comes in from the side, you may still get wet. The bivy provides an extra layer of protection, and can also offer a bit of warmth due to its ability to block wind. So what is the major advantage to tarps? Total weights can range anywhere from 2 pounds down to 4 ounces. Yeah – I said 4 ounces. This is how you get your pack weight under 5 pounds! What are the disadvantages to tarps? That all depends on who you ask, and how long they have been using a tarp. Just like single-walled tents require more skill than double-walled tents, tarps require more skill than any other shelter. I eagerly headed into the backyard after buying my first tarp, only to find that one hour later, I still couldn’t get all of the slack out of the tarp! I would adjust the guy-line in one corner, only to have the front pole tilt sideways and cause slack in a different area. This cat-and-mouse game went on and on. My first experience “in the field” was even rougher, as the others in my group were well past setting up their tents and were eating dinner before my tarp was up. To make matters worse, high winds came up, stakes came out, and as the rain began to fall, a kind brother offered to let me sleep in his tent with him. In addition to a steep learning curve, there is the obvious fact that you are much closer to mother nature. For some this may be an advantage, for others a disadvantage. Mosquitoes absolutely love my wife, so she much prefers the protection that a tent offers. Terrain is a consideration as well. I took a tarp once to the deserts of southern Utah, and the sand wasn’t firm enough to hold stakes. I’ve also been to areas of southern Utah where slick rock was the only thing around – again, not a good situation to be in when your shelter requires the use of stakes. Hammocks are a fun and lightweight alternative to all of the shelters we have discussed so far. Using a hammock for backpacking will require two stout trees to anchor to. Tarps are set up over the hammock to offer rain protection. 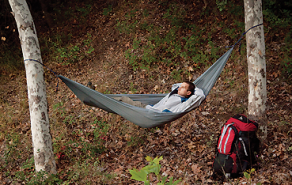 If trees are not available, hammocks may also be used as single-wall tents or as part of a tarp system. Jacks ‘R’ Better makes some great hammock setups that you may want to check out. Most of the places I backpack either have no trees (the desert), or can’t be depended upon to have trees (I often find myself making camp above the timberline in the mountains). Because of this, I have very little experience with hammocks, and I’ll let you peruse them on your own from here. Hammock Forums is one popular discussion board that can provide you with more information in regards to using hammocks for camping and backpacking. Each style of backpacking shelter comes with its own advantages and disadvantages. The “best” shelter is the shelter that allows you to be comfortable and enjoy your time backpacking. 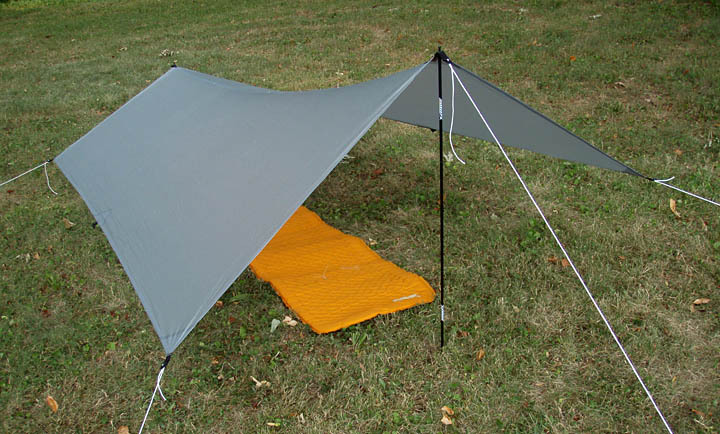 While I would love to pack around a 4-ounce cuben fiber tarp, it just doesn’t suit my needs right now. My wife and I love the spaciousness and protection that our double-walled tent provides. While our tent is one of the lightest double-wall tents available, it does add a good amount of weight to my pack, and because of this, I’ve chosen to go even lighter on other items to “make up” for that extra weight. If you’d like to keep your traditional tent but still go lightweight, it can definitely be done. If you feel like experimenting with some even lighter options, give some of these other shelter styles a closer look!